During the summer months, the cows are brought to the high alms in the European Alps to eat fresh grass, while the cowboys and their wives make delicious cheese from the milk. You all know the great Swiss Cheese. 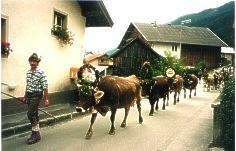 The cows are brought down to the villages again in autumn, around october. See the related words below. While the cows are roaming freely, the sound of the cowbell tells the guardian where they are. The leading bull gets a most nicely decorated cowbell, the pride of its owner. There are quite a lot of them to be seen here. The above photo is also from this online store. From the book "Candy in the Rain", by Edin Saračevic (Slovenia, 2001). Alpine Pastures, Husbandry: has been going on in the Alps since the La Tène Age (Celts). At first, the high Alpine pastures (alms) were used (Bronze Age relics found) and the valleys were not used until later. The oldest pasture areas bore Celtic, later Rhaeto-Romanic, then German field names. In places where the permanent settlement is at a high altitude, (e.g. Lech in Vorarlberg, Obergurgl in Tyrol), there are no separate Alpine pastures. In places where the farms are in the valleys, mountain pastures are used in 2 or 3 stages. 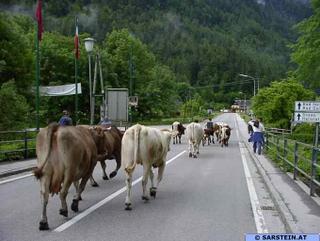 2-3 weeks before the actual mountain pasture season, the animals are brought to what is called the "Maiensaess" (= lower pastures, or "Vorsaess", clear patches in the forest belt). The actual Alpine pastures, or alms, themselves are around or above the forest line. Around 1900, official support of the use of the Alpine pastures was introduced after P. Schuppli's pioneering work in the field. Since 1907, laws for the protection and support of Alpine pastures have been in place. Everyday language, sagas, customs, popular traditional dress and art clearly demonstrate the significance of Alpine pasture use as an area of life in popular culture. The lead cow gets a beautiful decoration.
. The COW as Kigo . 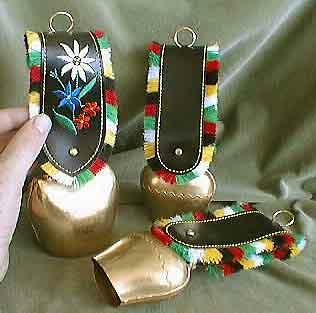 Cow bells are so lovely! I have started a collection of them myself and have one wooden one from Bali, one from Sumbawa and one from the U.S. I thought it was so sweet that in Switzerland the bull gets a specially decorated cow bell!